My name is Andrew, and I am a stationery addict! I live in Queensland, Australia, and I am aiming to review stationery which is affordable, innovative and awesome. I want this website to help people fall in love with obtainable stationery, the sort of thing you can use every day, which still says “I take pride in the stuff on my desk”. I work in I.T. in Queensland’s capital city of Brisbane. 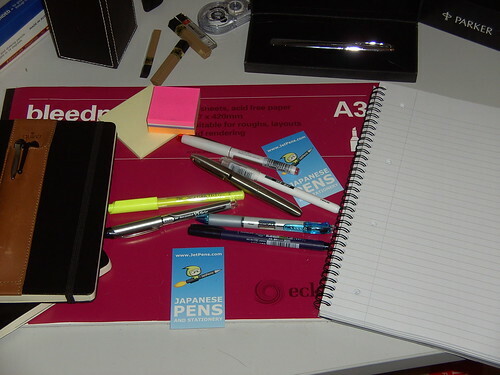 There are a few stationery shops within walking distance of my office, and I do frequent them whenever possible. My wedding in July, 2011 was one of the happiest days of my life, and my wife Patrice loves stationery too! She is currently studying Nursing, and working two jobs, one as a student advisor at her university, and the other as a sales assistant at a jewelry shop locally. Remember that all my opinions are just that, OPINIONS. Feel free to disagree with everything I say. Personally, I have been interested in stationery for quite a long time. I guess it could even go back to primary school where having better pencils was a “status” thing, and friendships were won and lost over who you would let borrow your eraser. Since I can remember I have collected interesting pens and notepads, rulers and various other stationery items. When I started work, I had a little more expendible income, and so I bought my first Moleskine notebook, which instantly sparked my curiosity in “fine” stationery. As I ordered more online, and began reading stationery blogs, it made me want to start my own. This is where Stationery Review comes in! My aim for this blog is to have fun experimenting and trying new stationery items, offering my oppinion and helping people make the right choices when purchasing these things themselves.